Over the past few years, Team AMSOIL has truly lived up to its name by taking on a “Team” approach. For the past four years, snocross team owner Steve Scheuring has helped AMSOIL implement a generator oil change program at the Loretta Lynn’s Amateur Nationals motocross event. In our new partnership with Monster Energy Supercross, off-road truck driver Scott Douglas not only helped bring our new toter home to the first round in Anaheim, he brought his AMSOIL Cup-winning truck to display at the second round in Phoenix. Meanwhile, offshore powerboat racer Bob Teague is helping with logistics as we store our display rig at his shop in Southern California. Off-road truck driver Mike Oberg was on display at the AMSOIL World Championship Snowmobile Derby, even taking his truck around the ice oval for a few “practice” laps in front of the sold-out stands. We want to thank all of the partnerships that are helping showcase AMSOIL both on, and off, the track. When AMSOIL signed on as the Exclusive Official Oil of Monster Energy Supercross, the company knew the sport had an exceptional fan base that would cram coliseums built for other sports such as Major League Baseball and the National Football League. After the first two rounds of the 2011 season, it’s the growing legion of fanatics that has been the most impressive stat for AMSOIL. In Anaheim, a sold-out crowd of 45,050 watched the world’s best riders go bar-to-bar. In Phoenix, attendance was up 20 percent at Chase Field as 51,064 devoted supporters took in the down-to-the-wire finish. Just as important for AMSOIL exposure, those events brought almost 50,000 fans through the pit party and past the corporate AMSOIL display. Outfitted with a 48’ Renegade toter home and a 20’ Stacker trailer, AMSOIL is crisscrossing the country in 2011. At the heart of the supercross display is the opportunity to win Team AMSOIL rider Kevin Windham’s bike. The bike, which will be an actual race-ridden Honda CRF 450 from the most popular rider in supercross, will be given away at the end of the year through a text-towin campaign. K-Dub’s Honda will be on display inside the AMSOIL booth at each round, and fans young and old are provided the opportunity to have their pictures taken with the #14 ride. Along with supplying information on AMSOIL and its products, a simple child’s game rounds out the display this year. 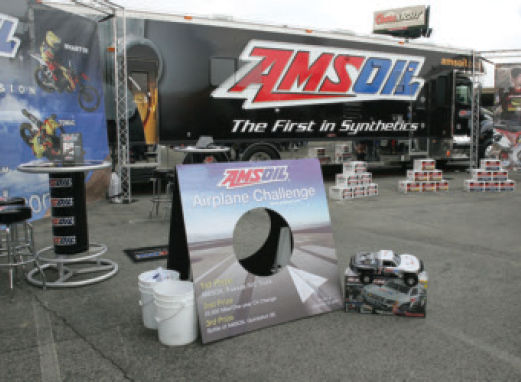 The AMSOIL Airplane Challenge is generating interest and leads at a frenetic pace. At each round, fans can fold a paper airplane and throw it through a target for a chance to win a Traxxas/ AMSOIL R/C truck. In Phoenix, the game was set up right next to the actual Scott Douglas AMSOIL Ford F-150, helping showcase the company’s involvement with the Traxxas TORC Series presented by AMSOIL. Douglas was in the Phoenix area as part of a Traxxas display for the Barrett-Jackson Auto Auction in Scottsdale, and was an excellent draw for race fans. In February, the tour begins moving east, with races in Texas and Georgia, as well as the final stops in California. For fans who cannot attend, Monster Energy Supercross can be watched each weekend on either CBS or SPEED. As the Exclusive Official Oil of Monster Energy Supercross, AMSOIL boasts a significant presence at each round. 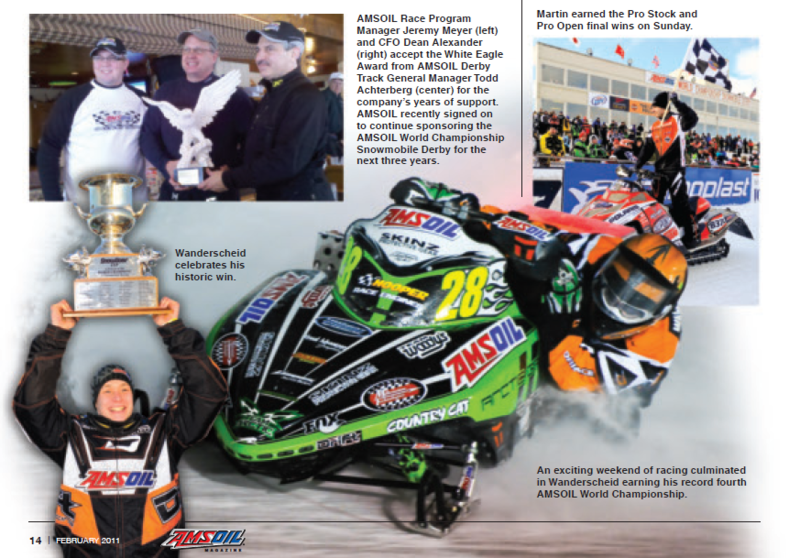 The AMSOIL World Championship Snowmobile Derby took place January 13-16 at the AMSOIL Eagle River Derby Track in Eagle River, Wis. and featured one of the most exciting races in the event’s 48-year history, with Team AMSOIL ice oval racer P.J. Wanderscheid coming out on top and making history in the process. The event kicked off Thursday with practice and time trials, where Wanderscheid clocked in third fastest. Friday featured the Friday Night Thunder program, where pole position in Sunday’s feature race was at stake. After winning his eight-lap heat race, Wanderscheid took the early lead in the 16-lap final and didn’t look back, taking the win, securing the pole position in Sunday’s feature and earning a day of rest and preparation on Saturday. Starting Sunday with practice laps, Wanderscheid clocked in with the fastest time. The World Championship race featured a different format this year, increasing from 25 to 30 laps that were split into two sections. Drivers raced 15 laps, took a five-minute pit session, then resumed the final 15 laps with a staggered start according to how drivers finished the first 15 laps. Upon the start, AMSOIL-backed driver Gary Moyle jumped out to the early lead with Wanderscheid close behind. Moyle led the entire 15 laps, with Wanderscheid narrowing the gap slightly on lap 13. After the pit stop, Moyle and Wanderscheid thrilled fans with an epic battle for the title as they continually exchanged the lead. Wanderscheid took the lead for good on lap 29, taking the win and going down in history as the only racer to win four AMSOIL World Championships. Moyle took second, followed by ice oval racing legend Jacques Villeneuve. Team AMSOIL found further success on the snocross track, where AMSOIL racers swept the podium at the Friday Night Thunder Pro Stock final, with AMSOIL/Scheuring Speed Sports racer Robbie Malinoski taking the win, followed by AMSOIL/Judnick Motorsports racers Ross Martin and Mike Bauer in second and third respectively. Malinoski also took third in Friday’s Pro Open final behind Justin Broberg and Brett Turcotte. On Sunday, Martin took the Pro Stock final win, followed by Malinoski in second, Kaven Benoit in third and AMSOIL/ Scheuring Speed Sports racer Darrin Mees in fourth. Sunday’s Pro Open final featured an exciting battle between Martin and Turcotte, culminating with an awe-inspiring charge by Martin from the final turn to the finish line for the win. Turcotte finished second, Broberg third and Malinoski fourth.